IF you’re in the mood for good food, decent craic, great live music and a feast of family entertainment, then get yourself chop chop down to The Chophouse Brasserie at Merchant Square in the Merchant City for the St Patrick’s Festival Family Day Extravaganza on Saturday 17th March. The culmination of a week-long festival, the Family Day festivities feature a cornucopia of local bands, dancers, singers, musicians, bards and characters to contribute to a day of community celebration. Kicking off with a Céili in the main square at 12pm with St. Rochs Céili band and Glasgow Irish Céili-Set Dancing club followed by a full programme of entertainment, including local big guns, The Amadans, The Wakes, Quigleys Point and African-Celtic drumming sensations, ZUBA BASS BEAT, and many more performers making guest appearances throughout this great day. Bringing 1930s New York-style dining into the very heart of Glasgow’s cultural, fashion and food quarter, The Chophouse Brasserie is a classic steakhouse and brasserie for discerning diners serving up a mouth-watering selection of fresh, home-cooked food at affordable prices. Located within Merchant Square, once part of the old Glasgow Fruit Market, diners at The Chophouse Brasserie can enjoy the warmth and comfort of the Victorian courtyard that brings the outside in under a glittering canopy of stars. The St Patrick’s Festival Family Day Extravaganza takes place on Saturday 17th March with festivities starting at 12 noon and finishing by 6pm. The Chophouse Brasserie is open seven days a week from 12:00pm – 10.00pm and from 12:00pm – 11.00pm Friday and Saturday. To reserve a table call 0141 552 4200. 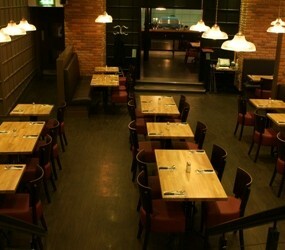 Log onto www.thechophousebrasserie.co.uk for more information. MEDIA RELEASE posted by Liquorice Media. You too can post your media releases (aka press releases) on to allmediascotland.com. For more information, email here.